Stamford and Spalding are both involved in big cup games tonight (February 17). 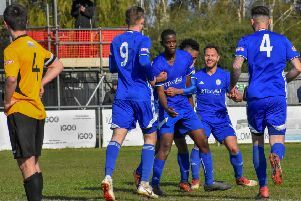 Stamford entertain Evo-Stik League Northern Premier Division rivals Grantham Town in the semi-final of the Lincolnshire Shield (7.45pm) while Spalding visit Ilkeston for a Doodson Cup quarter-final clash. Four local sides are also in ChromaSport & Trophies United Counties League Premier Division action tonight. Deeping Rangers entertain second-placed Yaxley at Outgang Road, Wisbech Town are at Boston United and Holbeach are away to Harrowby United. Huntingdon are at Potton in the Hinchingbrooke Cup.